I continued to work on the flower beds I created from the torn down chicken shed. I fenced it in and planted some spring bulbs and fall pansies. Two of the beds on the right are vacant and I will plant some shade flowers in the spring. The dark spots without mulch still need some tall growing bulbs. The old chicken shed/new flower bed. Pansies for fall - bulbs for the spring. We are going to Australia next week for Fergus’ interview with the Australian College of Emergency Physicians. They told him that it could be as long as three months before they can tell him their decision. We decided to bring the dogs back to Kansas since it might be three months and no telling how long the immigration process may take. It is too much to ask BS and Cooper’s foster families to care for them any longer and we miss them too much to go for possibly another 6 months without them. So I decided we need to fence the yard. They have lived in a fenced yard for over a year and 1/2. I worry about Cooper chasing cars down the driveway like he use to and getting hurt now that he is older and not as likely to recover from any injuries. 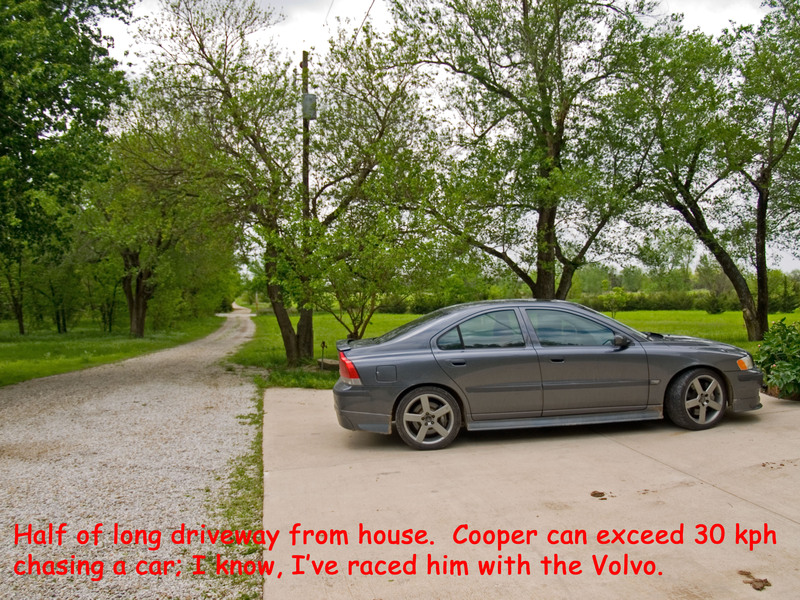 I also worry with potential buyers coming to look at the house that he will be too aggressive towards strangers. We put up a nice decorative fence at the driveway and an almost invisible wire fence around a large area of the back yard. I hope this will stop them from roaming too far from home once they return. No “walkabouts” allowed in Kansas. The fence is almost invisible from the house. The wire fence is attached to the five trees in a row in the background. I hope it will keep them safe. Of course they like to dig so we will have to make sure they don’t go under like in The Great Escape. Our garage actually can hold two cars. I know because I was finally able to put both of them in there. 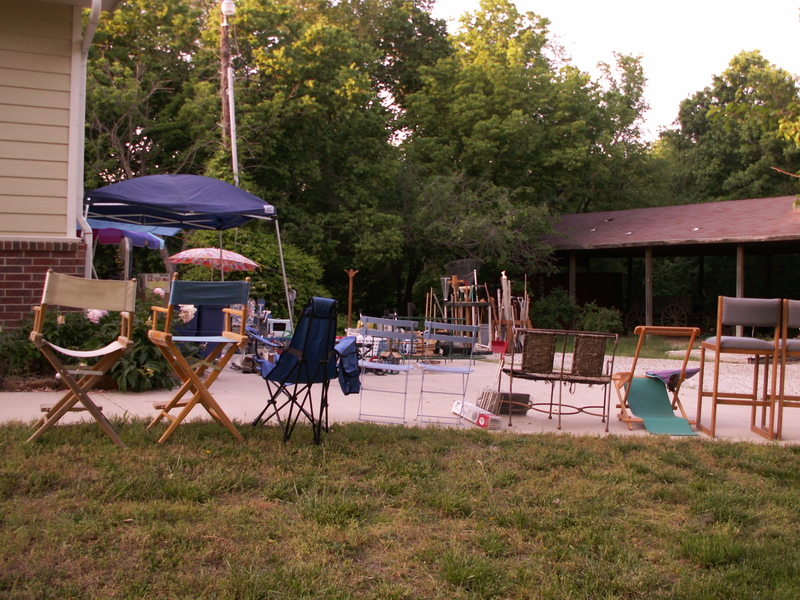 Most of the leftover garage sale items went to the auction house for last Saturday’s auction. And some of the garage shelves were picked up by the guy who bought them. So there is room for the cars but not much room to open the doors. When we get back from Fergus’ interview at the beginning of October I will know if I need to have a couple of more garage sales to get rid the things we have been using but won’t take with us: microwave, washer & dryer etc. The leftover books were donated to the two local libraries for their fundraisers. The rest of the stuff in the garage are gardening items we still need to use and boxes of things we will be taking with us. It feels good not to be hanging out in the garage on my weekends. Of course this weekend it rained so I spend most of the weekend indoors. 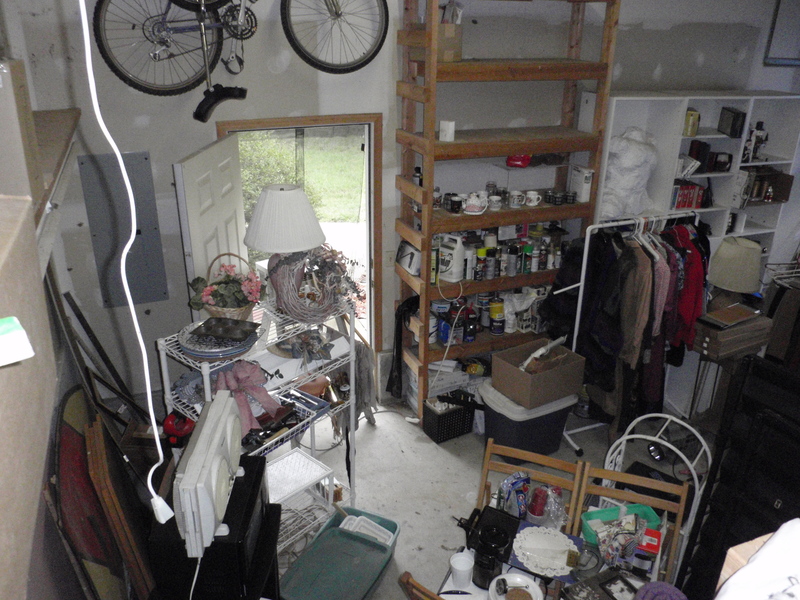 I called the auction guy and he said I didn’t have enough stuff to auction – can you believe that? So I took a break last weekend and didn’t sit out in the garage for two or three days. Instead I went on-line and started selling our books. That ended up being a week long project but I sold a TON of books. If you need to know what to do email me. It isn’t that profitable but it won’t take as long as having people come through and buy one or two books from the hundreds we have. I have a guy coming out next week who seems interested in buying a bunch of books so cross your fingers. So what else is new? 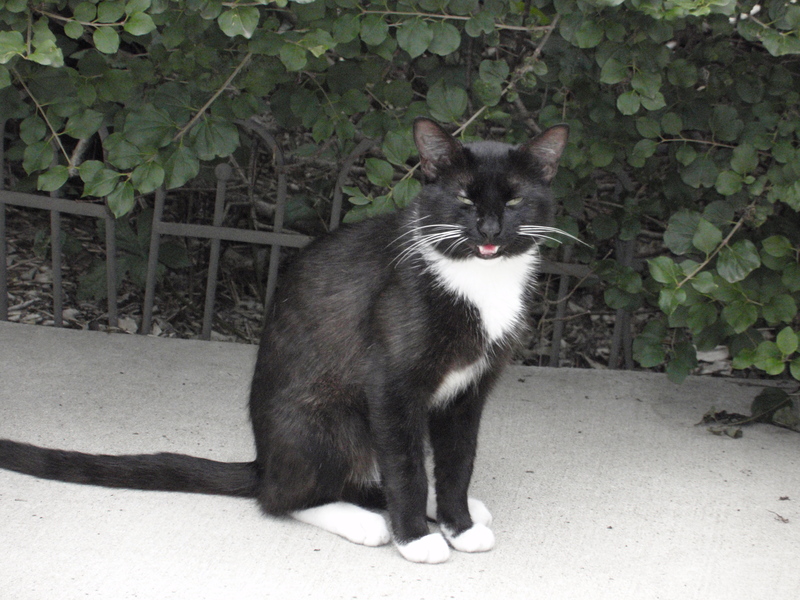 Fred Astaire is warming up to me – or at least likes the food I have been serving him. He is letting me touch his ears while he eats. This morning he was out at the street and I called him and he came running all the way to the front porch. He loves it when I do the garage sale because all day long he watches the cars come up the driveway and then he comes and visits me after people leave to see what I have sold. So that’s about it for me. I’ve had a few calls about the house but no offers yet. I put an ad in the paper this weekend so maybe I will get a few more interested parties. I hope everyone is having a good summer. Stay in touch. I am finished with this garage sale business. Yesterday I spent the entire day in the garage without one single customer or sale (the first time since the start of this project). I see that as a sign that it is time to try something new. I did set up a CD player I have for sale and put on some of my favorite music so I was able to sing at the top of my lungs (Fergus was at work so there was no one to bother except the birds and the cat). 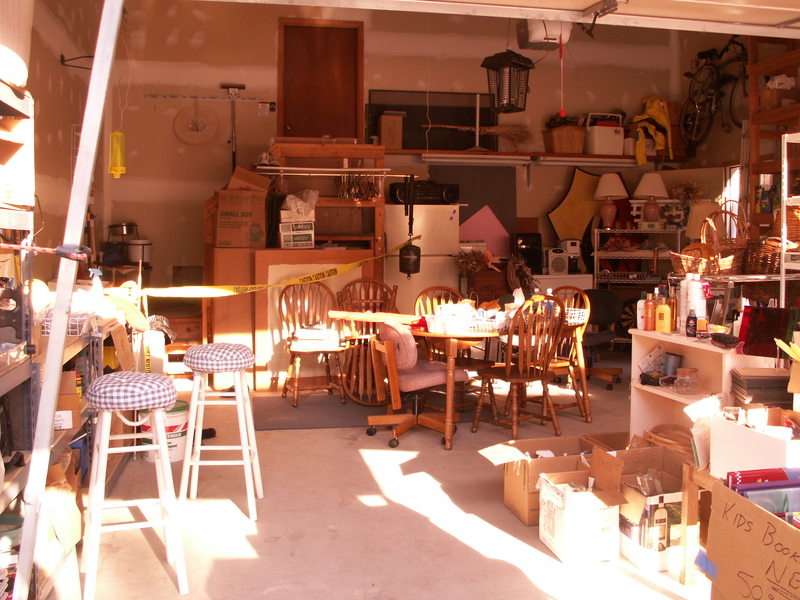 I danced to the music of Gloria Estefon and Micheal Jackson, so I got some exercise, and I rearranged the mess in the garage. It was a productive day but not a profitable day. Today I am going to call the auction company and set up a final auction sale to get rid of the rest. I want to focus my energy on packing and selling the house. 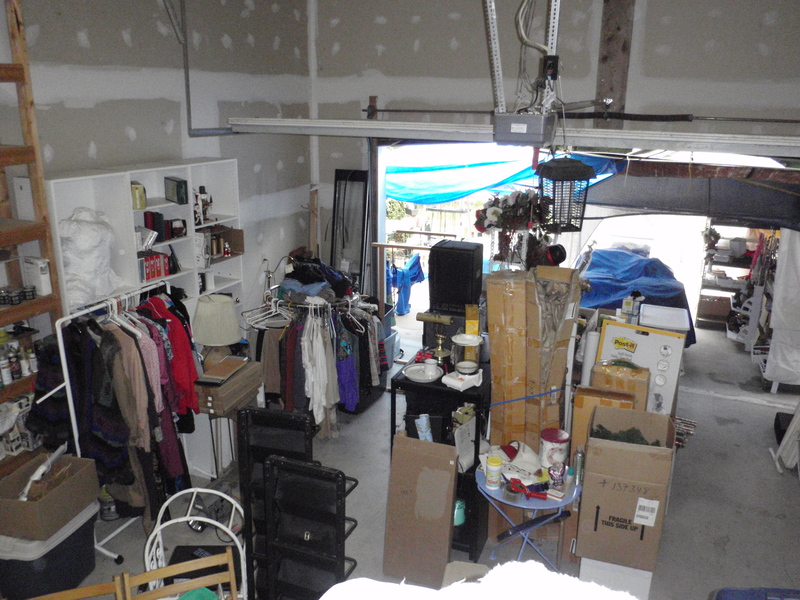 Here are final pictures of the inside of the garage (before the rearrangement). 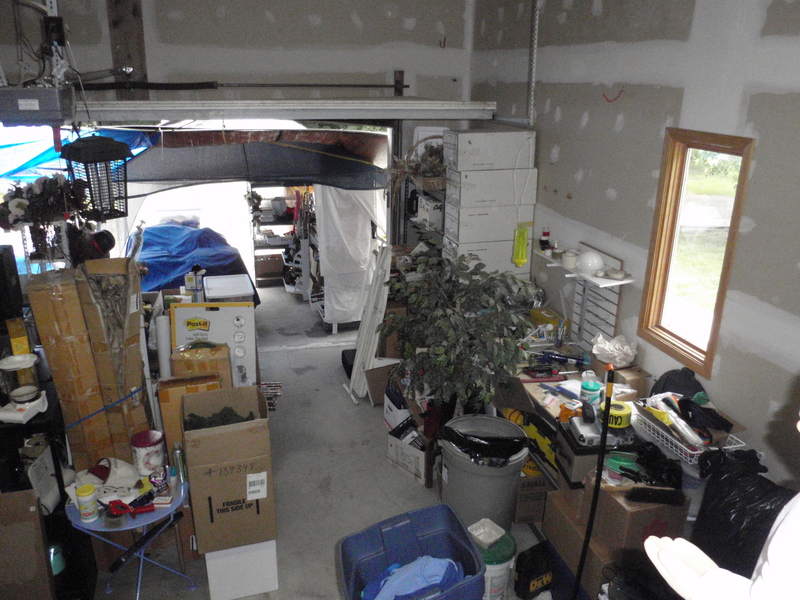 After the auction I hope to show you a garage with two cars parked inside. What is all the caterwauling I hear? 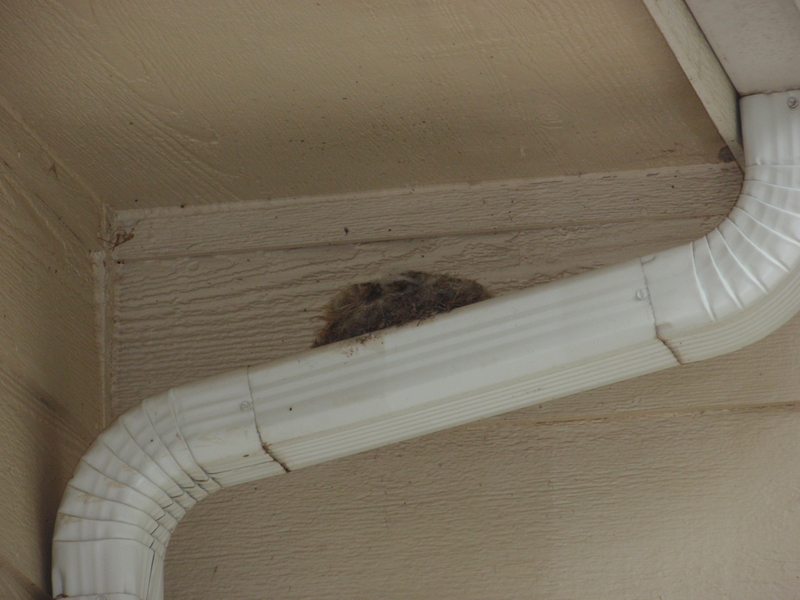 Even baby birds duck their heads and cover their ears when they hear me sing. Everything is the same here. 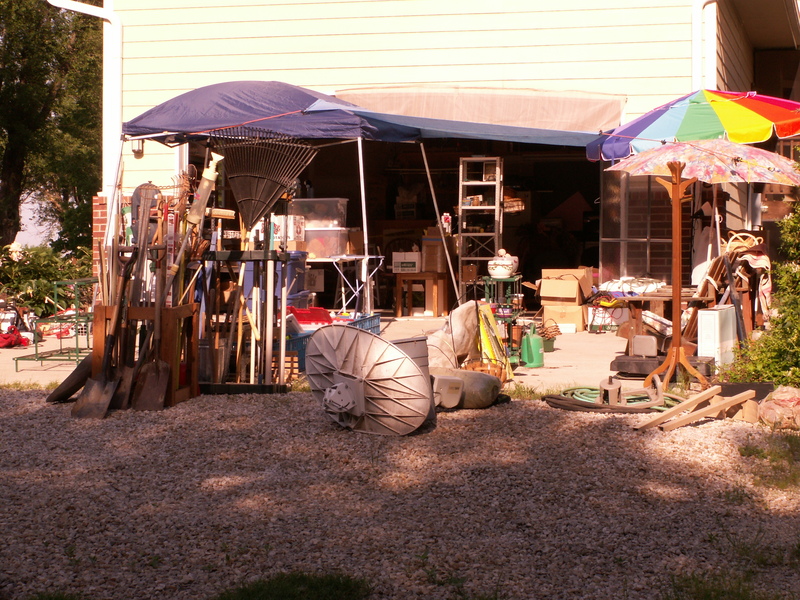 I am still doing the garage sale every weekend and have almost all the stuff out the the house, storage shed, and basement that I want to get rid of. I shipped some things to my friend Kelly in Idaho, mostly decorative fabric for her annual Snow Ball, and some Christmas decorations that I had for sale at Pages, my book store in Emmett. I sent a box of my favorite novels to Sue in Australia adn a few items to Cooper’s foster family. Fergus sent some Sci Fi books to Curtis in California. If anyone wants something let me know before I pack it all up to ship or for Goodwill. I’m thinking about having an auction and just getting rid of the rest in one full swoop. I will call the auction people this week and see how quickly that can be done. I have the house listed on a For Sale By Owner site. I’ve had three couples come and look at the house but no offers just yet. It has been incredibly hot here the last few days so being in the garage has been like baking in an oven at 100 degrees for eleven hours. I am sweating off the pounds – which in itself is not a bad thing. I lost a lot of weight before we went to Australia and while we were there it started to creep back up (especially after we finally got a car and I wasn’t walking everywhere and we were finding all those great places to eat). Since we’ve been back I have been getting back to my pre-trip weight and feel much better. This afternoon we are going to see “Camelot” at Music Theatre of Wichita. We have had season tickets since we first moved here. We have Sunday matinee seats and then we go out to dinner – our only real date night. I’ll let you know how it was. I’ve seen Camelot on stage three times before once with Richard Harris as Arthur and once with Robert Goulet as Arthur. There won’t be any “famous” stars in this one but MTW puts on really good Broadway quality shows. Friends of mine work on the shows as costumers, set builders and occasionally performers so it is always a treat to see their names in the playbill. You can check out their website here MTW. Wish I was there to organise your garage sale with all those people coming up the driveway. I think it would be fun to bark at so many people. I don’t do alot of barking here except when someone is out in MY street and making a noise. Fergus and I take it in turns so Aunty Jenny thinks that is good, that way the neighbours think there is only one noisy Airedale. I helped Jenny in the yard today when she was pulling some weeds out around the little fish pond. I also, gave her support as she mowed the front lawns, as I could see her from the bedroom window. Bark Bark Bark yes that how to do mow the lawns Aunty Jenny. Gosh I am a good boy!! happy to be home and I put on my bestest smile and tail wag for her to make her feel welcome. Aunty Jenny has had Daisy on a diet for a long time and when she came back from Fosternan’s place she has put all that weight back on in 2 weeks. Fosternan overfeeds furkids Jenny said. Jenny wasn’t too pleased. 6 months dieting gone in 2 weeks. Us furkids sort of hang out together sleeping in the same rooms during the day which Aunty Jenny thinks is nice. Usually in the room where Aunty Jenny is working but Fergus and I sleep up in my BIG bedroom alot. I have also been a busy boy working on another bunker that Aunty Jenny found this morning. She wasnt too impressed this time and said that we will hide that one from Uncle Gary. But don’t worry I didnt do any damage. I just dug up heaps of rocks and stuff that will have to be filled in. Boys have gone to their Dad’s this weekend, they said they don’t like going there as he doesn’t do anything with them so they get bored. I am missing them cos they give me heaps of cuddles all the time. Did you make enough money from the garage sale to buy me some new toys??? Huh Huhh did you??? I hope so. Aunty Helen sent Aunty Jenny an email about skye but Aunty Jenny wont be able to do it on her laptop but Uncle Gary is installing it on his laptop so we will see how we go with it. Jenny will ring Helen one day this week to say hello and see how everyone is doing. I can’t wait to see BS on Sunday. Better go now as I am pooped from gardening and landscaping. I am getting to know all the neighbors because they see the sign at the mailbox and then come down the driveway to check it out. I made a few dollars. I may need to send it to Aunt Jenny so she can restock the supply of treats for you, Fergus and especially Daisy. I have found boxes and boxes of stuff we haven’t seen in years. I am packing your favorite bowl and the stand for it, I found Bean Sidhe’s Living room bed – the elegant blue one that she loves so much. I have one big box of all your special toys. On one of the shelves I found an old picture of your big brother, Galen. I had a little cry because I miss him so much (and probably because I’m missing you and Bean Sidhe so much). The neighbors all ask about you two and are excited to hear about your adventures in Australia. I don’t think the mailman is missing you for some reason. You should have Bean Sidhe tell Daisy about how hard it is for a girl to maintain her figure. I’m sure they could share tales of their favorite meals – and grandparents who spoil them. I sure Aunt Helen is making sure she doesn’t take Emma or Teddy’s dinners. I know how much you enjoy working in the garden – you always ran into the house once Dad started the mower – but you are a good supervisor from the window. All these years I have been accusing BS of digging holes in my flower beds – hmmm now I know who really did it – bad boy. I hope you aren’t telling Aunt Jenny that Fergus or Daisy are doing it. I’m sure Bansch is as excited as you are to see each other. Now don’t play too rough – remember your leg and her arthritis is bothering her. Emma is probably able to handle your rough-housing. Here is letter I sent to Bean Sidhe and Cooper about what I have been doing. Today I had a “Garage Sale” which meant I had to take EVERYTHING we had in the garage and pull it out so that people could look at it and ask to have it for almost nothing. It took me all week to get the shelves emptied and cleaned, I had Dad bring up some of the boxes of stuff from the basement and some from the closet. It was hard dirty work (what I did not what Dad did). Cooper you would have hated it, all day long people where driving up to visit and buy things. One lady even had her little black dog with her- nothing special like an Airedale but I got a nice doggie cuddle – my first since leaving you guys. I sold my bike and some garden tools and a patio umbrella. A nice man with two little kids bought some children’s books.They are all excited about us moving to Australia. Do you two remember the old farmer Butch who lived at the next farm down the road? (Cooper I think you nipped his ankle once.) He stopped by to say hi. He is retired now and he and his wife moved into a house in the city. His son-in-law is working the farm and he has rented the house to…guess who? The nice man with the kids who came by and bought the books!!! I saw that black cat again today but by the time I found the camera it was gone. I also saw some deer really early this morning. I will carry my camera with me so I can send you some pictures of them. I’m excited for your visit with each other next week. Please ask Aunt Jenny and Aunt Helen to take lots of pictures so Dad and I can see how you are. You might see if Aunt Helen can send me her Skype address and maybe we can call while you are there. Wouldn’t that be nice!! Well, I’m beat and I have three more days of garage sale-ing – then again next week. Love and kisses, hugs and rubs! Missing you. We got back in Kansas on May 7. It’s spring and everything is green. Our first night back it stormed – rain, wind, power outage and even a small tornado – we are definitely back in Kansas. The house was in pretty good shape. Our friend Alice came by a few days earlier and unpacked some essentials – bedding, dishes and the espresso machine. So it wasn’t too much of a shock coming home. The next day we were able to get the home phone connected – we got the old number back but we had to get new cell numbers. Internet service took a little longer. 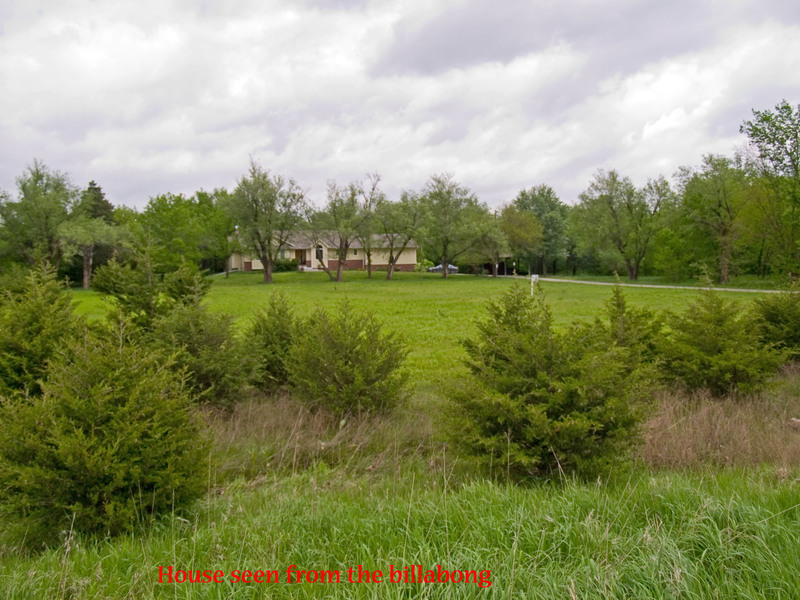 Here are some pictures of the old homestead.